I am a self-taught water color artist. Originally staying in Penang, Malaysia and now based in Kuala Lumpur, Malaysia, I love to paint scenery with some element of water in them – seas, rivers, lakes, boats, ships. My deep rooted connection with water stems from my involvement with seafaring during my early days, having sailed on the seven seas and experiencing life on water. To me, water is very special. It is life-giving, and yet can be destructive. Beautiful at some time, and yet ugly at another time. The water element captures beauty in nature through effects of light reflections and refractions, from gentle fluid movement to violent splashing foam. 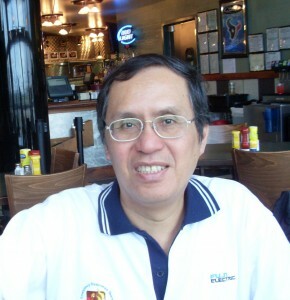 I was educated at St. Michael’s Institution, Ipoh, Malaysia. During my school days, I used to thrill my classmates with my realistic drawing renderings of human, animal, trees and other objects drawn with proper artists’ compositions showing perspectives to differentiate between near and far objects. That was my time of experimentation, trying out different mediums, materials, style, and observations. Sometimes, these experimentation came with surprises too. I remembered an earlier time when my art teacher asked me to explain about my watercolor painting. “What’s this?” she asked. And without much hesitation, I replied, “Clouds”. Not satisfied with my answer, she asked me again and I would give the same answer. This went on for three times. Well, I should have realized that they did not look like clouds. They were purple in color! The art classes that we had were very general in nature, they just let us experiment with our creativity – things like potato printing, watercolor pencil drawing, mask folding, opaque water color painting, wood carving, silk-screen fabric printing. Although not significant in terms of art technique development, this early encounter with art did helped me realize that I was pretty good with my hands. As I studied to determine my future career, I opted to join the science stream and focused more on the science subjects, but I still managed to create beautiful objects with my hands in my leisure hours. Knowledge of science sometimes did make creation of art possible. Plaster of paris moldings, ceramic grazing, even gemstone polishing could not have happened without my having some basic knowledge of science. After graduating from high school, I joined the Politeknik Ungku Omar, Ipoh, Malaysia to study Marine Engineering for a career at sea. This included apprenticeship training as a cadet engineer working on board ocean-going ships and a few stints of apprenticeship at local shipyards. After graduation, I sailed the seven seas and visited many countries on ocean-going ships as a marine engineer, visiting many countries in Europe, Scandinavia, Far East, North America, Australia, South East Asia, and very often visiting remote places far away from the regular tourists beaten track. In addition, I experienced all kinds of weather from mirror-surfaced calm sea in the summer months to the roughest typhoon-force sea wave condition in the winter; from high temperatures around the Red Sea to the sub-zero temperatures of Sweden.